A national public private dialogue on maritime, logistics and transport reforms was held on 2 October in Colombo. This forum was held under the EU-funded Trade Related Assistance Project implemented by the International Trade Centre (ITC). Interestingly the event which was supposed to be on the future of Maritime, Logistics and Transport didn’t see any presentations by industry stakeholders such as the Ceylon Association of Shipping Agents (CASA) who represent all major shipping lines in Sri Lanka. However CASA was invited to serve on one of the panels although our repeated requests for a slot to make a presentation was denied. ITC is likely to be continuously engaged in this dialogue under the auspices of the EU Sri Lanka Trade Related Assistance program. Hence the resources of the ITC both in terms of monetary support for events and resource personnel are likely to be used by the Ministry of Finance in pursuing the Public Private Dialogue. The Minister of Finance and Mass Media could not attend the event but State Minister of Finance Eran Wickremaratne was present and addressed the gathering. He was very forceful in his comments on the need for liberalisation with specific reference to allowing 100% ownership of shipping agencies as a means to encourage Foreign Direct Investment and assist the growth of Sri Lanka as a maritime hub under its Vision 2025 initiative. Various presentations were made by speakers invited by the ITC outlining developments in the UK, Hong Kong, UAE, India, Bangladesh, etc. on maritime developments and issues and in some cases initiatives in terms of liberalisation. 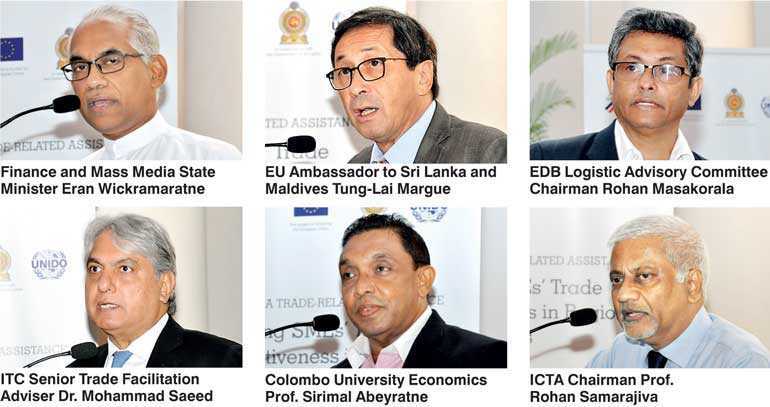 The overseas speakers refrained from directly addressing the Sri Lankan issue and some of the speakers advocated that the issue of liberalisation should be reviewed in a broader context and not in a narrow context of the ownership of shipping agencies. In a session titled ‘Finance Ministry Perspective on Policy Change’, Ministry of Finance and Mass Media Economic Advisor Deshal De Mel and Ministry of Finance and Mass Media Senior Advisor Mano Tittawela expanded on the views expressed by the State Minister and reiterated the ministry’s determination to move forward with liberalisation. However at this session the CASA representatives had the opportunity under Q&A to express some of their viewpoints. Based on this the Ministry Advisors did indicate the need for a continued dialogue and the possibility of a phased in approach. The audience consisted of representatives of the public and private sectors engaged in trade and logistics. Interestingly the opposition from the floor towards CASA’s stance was limited. On the contrary several representatives from the floor also expressed the view that the ownership structure of shipping agency business was not a stumbling block in their efforts in increasing trade and broader issues such as the ease of doing business, customs and other regulatory issues and port capacity expansion were imperatives that should be considered over and above the agency shareholding issue. The overall takeaway from the dialogue is that the Ministry of Finance and Mass Media supported by the ITC and few shipper associations would continue its efforts to pursue the agenda to achieve 100% foreign ownership of local shipping agencies. Hence CASA needs to intensify its efforts to engage the Minister of Finance and related organisations and educate them of the role played by the shipping agents in promoting the maritime initiatives in Sri Lanka in order that the policy makers could make informed decisions. Talk of the town: Misleading, misinformed and confused? The maritime and logistics industry circle and financial professionals are baffled by a statement made by a senior business leader of a conglomerate last week to President Maithripala Sirisena that in the event of shipping liberalisation the country will lose $ 800 million. A source from Central Bank said that this number is false as this is the country’s freight bill and the position that the country retains through the agents which are ranging from 1.5%-5% commissions of the total revenue. It is also understood that the freight paid fully is recovered by exporters who invoice on CFR basis and this commission amount is factored in by shipping lines when quoting a freight rate to an exporter or an importer, and in other cases like garments freight is paid by the international buyers. Meanwhile Prime Minister Ranil Wickremesinghe who had been at this gathering had been visibly annoyed by this statement, and has informed and requested the said business leader who represents a large agency group not to mislead the President, Government and the public of this country and had said that policies will be driven by the Government for the best interest of the country and has requested Central Bank to provide the needed statistics. Some ministers have commented that if such revenue has been collected, these companies have hidden taxes in a big way to the state. In another development at the same gathering Mahinda Samarasinghe has objected and protested that a shipping forum has happened without his knowledge and confronted the Finance Minister that he should consult him and invite him for such events. Industry sources said that this had led to a heated argument among the ministers and the President had informed that in future the line minister should be invited. However, when enquired from Finance Ministry sources, the fact has been that the shipping minister had been invited for the roundtable discussion which was allocated for ministers of this two-day event, where up to 15 other ministers had been invited for a broader discussion. Deputies and State ministers too had been invited. It was not only maritime, but transport and logistics sectors too had been invited. Ministers Nimal Siripala De Silva and Mahinda Samarasinghe and their deputies and secretaries had also been invited under Mangala Samaraweera’s signature, Finance Ministry source said. But most have declined to attend the closed-door session on 3 October including Mahinda Samarasinghe; sources said only State Finance Minister Eran Wickramaratne was invited for the 2 October event to inaugurate as this was a cabinet day whilst it was a public private dialogue where six international speakers first presented their experiences on how Sri Lanka could follow the best practices of the world where over 150 participants from 50 institutions and chambers and government authorities took part from both private and public sector. The misconception of liberalisation of agency ownership resulting in lower freight rates and more FDIs were proved irrelevant and invalid. A question was raised at Julian Bevis, Senior Director, South Asia – Maersk Group whether they can reduce freight to help the importers and exporters to bring their cost down with the proposed reforms for which he replied saying that they are not in a position to reduce rates. This annulled the argument that freight rates will be reduced by changing the ownership structure of the industry. It was also noted that two committees which was appointed earlier to review regulations made under the licensing of Shipping Agents Act No. 10 of 1992 have turned down the removal of the restriction stating that the shipping agents are not engaging in trading and is just an operational arm of the principal. The presidential committee on Maritime Matters of February 2009 clearly states that the present ratio of shareholding of joint venture shipping agency companies is satisfactory and conducive for the development of the shipping industry. SMEs in the shipping industry will also get affected by this move. These companies have helped Sri Lankan ports to compete with regional ports by continuously reaching out to foreign shipping lines and attracting them to Sri Lanka. Out of close to 11500 vessels that call at Sri Lankan ports annually, about 8000 are casual caller vessels (non-container vessels) which are serviced by the SME sector. The most common examples which were highlighted by many speakers were the telecommunication and banking industries which were controlled in the past and opened subsequently in Sri Lanka. It is a known fact that both these industries were Government monopolies and were inefficiently run before it was liberalised. However the Shipping agency business is a liberal and a very efficiently run sector performing at optimal level. As stated by some of the exporters who were present at the event they have been getting competitive rates and that dealing with local agents have given them the opportunity to negotiate better. Cartelising was another word used to state that few players dominate the industry. It is important to note that the shipping lines are allowed to select their agents based on merit and without any control or influence followed by a competitive bid which makes the industry very liberal. It is not an industry of a few players. CASA has 130 members and out of it the majority is SMEs. Exporters and Importers are free to choose any line based on competitiveness of rates and service and therefore does not conflict with the concept of the government’s free trade policy. There was a case study presented on how Dubai has lifted controls for shareholding resulting in an impressive growth of the port sector. However the audience reminded that much of this growth happened during a controlled environment where foreign carriers could set up a limited liability company with a UAE national but cannot hold more than 49% of the shares with the balance accruing to the UAE national. Examples of Singapore and Hong Kong were also discussed at the event. These countries have their own controls and they have not given the ports to the people; the government controls all the ports. Each country has their own way of safeguarding the national interest. It was noted that a much involved dialogue with the local stakeholders is required with regards to reforms in the sector. CASA has played an integral part in the current success story of Sri Lankan ports which has made Colombo the 23rd largest port in the world and the fastest growing port in the world. So let’s not kill the goose that lays golden eggs. It should be the interest of both the public and private sector to take the industry forward from where it is now. CASA is committed to play an important role in initiating this discussion. CASA is not opposed to intelligent reforms that will benefit the country which creates value to the industry and overall country at large.